In 1843, Hudson's Bay Company officers lined up two beacons to mark Brotchie Ledge, and thus the park was renamed. 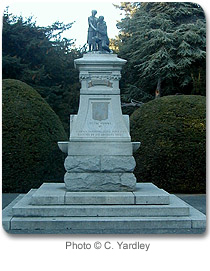 The park has been a hot bed for controversy over the proper use of the park since the late 1800's. A council was brought in soon after the park was declared in trust to the city. They brought in special by-laws banning cattle grazing, games of chance, discharging firearms, and carpet cleaning on the grass . . . talk about the wild west! 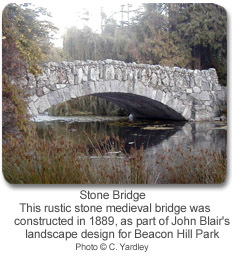 Scottish architect, John Blair, won a competition to landscape the park and about 2000 trees and shrubs were brought in. The park hosts a combination of native habitats and landscaped areas throughout the manicured gardens. Many of these plants are considered rare and endangered. The park provides habitat for a variety of birds and wildlife, like squirrels and swans, that coexist with human activity in one of Victoria’s most popular recreation spots. Recreational activities include walking and jogging, bird watching, dog walking, beach-related activities, sporting, horse back riding and special events. Park facilities include trails, a petting animal farm and wading pool, water fountains, picnic areas, monuments, sports fields and playgrounds, a band pavilion, famous Garry Oaks, and cultural features including what was once the world’s tallest totem pole. 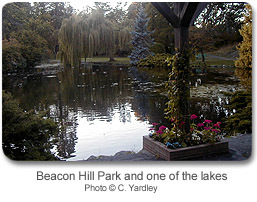 Artists gather to capture the great beauty of Beacon Hill Park; lovers meet at the lookout point to gaze at the breathtaking view overlooking Dallas Road. Carriage rides can be taken through the park and people feed the ducks daily. 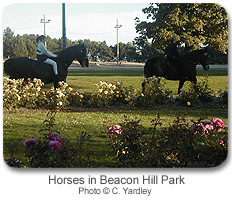 Over the years there has been great history to Beacon Hill Park. 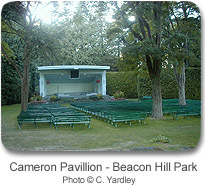 Famous Canadian artist and author Emily Carr played there as a little girl and enjoyed the park as a woman. 1903 The Chinese Bell, since removed to preserve it, was presented to the city. The bell, cast in 1627, was taken from a temple during the Boxer Rebellion. 1930's - A rose garden and stream joining Fountain and Goodacre lakes were created. 1948 - Cameron Pavillion was built. 1956, August 23 - Marylin Bell swam from Port Angeles to Finlayson Point in Victoria. 1968 - A hippie wedding was announced for hundreds of people to come together for a community festival of song, food, and love. 1986 - Park maintenance crews accidently dug up historically significant First Nations burial cairns. The cairns were rebuilt later that year. For many years birds were kept in a still-standing wooden aviary - until vandalism caused the birds a violent demise and all caged birds were removed from the park permanently. 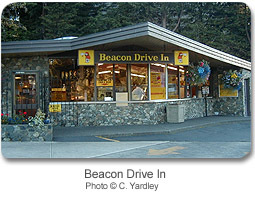 Before you leave the Beacon Hill Park area, you must make a special visit across the Douglas Street side of the park to the Beacon Drive In. It is by far the BEST PLACE to grab a coffee or tea, milkshake, soft serve cone, oyster burger (all hamburgers), fries or breakfast, all to eat in or take out! A Victoria tradition for residents and tourists alike. It's open year round. Open later in the evening during summer. YUM! Perfect before or after a visit to Beacon Hill Park.